I’ve had my Rosy Boa Isis and my two Rubber Boas for several years now. Amongst the other thousand reasons that I love spring, these three slithery friends give me one more reason: they wake up from their winter sleep. My three boas hibernate during winter, even though I have their heat lamps on at all times. Their internal clocks just know when it’s time to rest and right around August or September, they’ll all lose interest in eating and start slowing down. 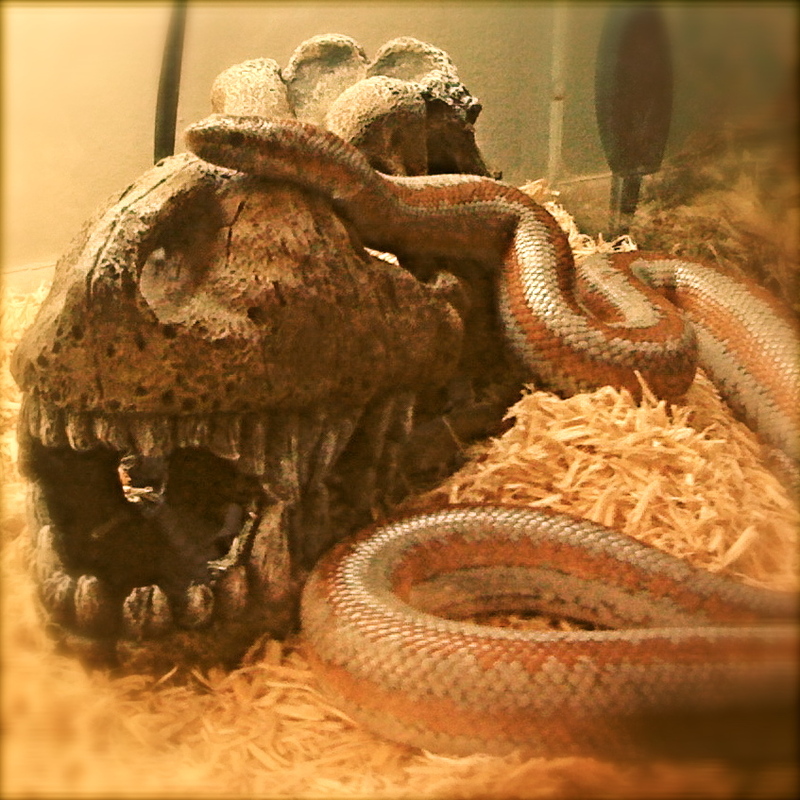 The two Rubber Boas will bury themselves into the wood chips and hardly emerge for more than six months. The Rosy Boa, however, doesn’t dig down or curl up in her hideout: she likes to lay right out in the open on the cold side of the tank and snooze. Every few weeks she’ll rouse herself for some water and a quick bask under the heat lamp, but then she’s right back to rest. Any offer of food during winter is duly ignored, so I get really excited for that first meal of the year. This year, the Rosy started to get more active in early March, while the two Rubbers didn’t appear until the end of March. The last time I moved, I needed somewhere safe to keep my giant Sugar Pine cone so I put it in the tank thinking at least it would be safe til I arrived at my new place. Turns out the Rubbers love climbing all over it and sleeping on it, so, well, it lives in their tank forever now. There was a full bowl of fresh, clean water in the tank but they apparently preferred slurping it off the walls after I sprayed the tank to raise the humidity a bit. Which seems weird, but I suppose I’m not one to judge weird. The Rubbers readily take pinkies by hand now, which is spectacular because it’s much easier to keep track of how many each snake eats when you’re giving them food individually. If I ever had to leave food in the tank overnight for them to eat, I had no way of knowing which one ate all the grub. These two happily each took three pinkies without hesitation. The male (pictured in the back, with the darker skin color) seemed a little confused as to how to find them and kept trying to eat my hand, but that’s pretty typical for him. The female (lighter color, up front) eagerly snatched her mice and wolfed them down faster than the male. Here’s a great shot of her jaws stretching wide and her using her coils to push the mouse into her mouth. Usually the male is the feistier of the two when it comes to being handled – he’s musked me countless times (and it smells TERRIBLE). This time around, the male didn’t put up much of a fight (maybe he’s still sleepy) and the female was the one to get testy after eating. Understandable, since they hadn’t eaten in close to nine months, I’d be testy too! Once I put her back in the tank, she actually coiled up into the typical Rubber Boa defense pose: the tail, which resembles the head but has a bony plate to protect it from jabs and pokes, sticks up above the coils to mimic the head while the head is protected beneath the whole body. Rubbers will sometimes even wiggle the end of the tail to confuse predators. She’s slowly coming out of the posture in the pic, but I wanted to share it with you guys anyway since it’s a neat one. I didn’t take any pics of the Rosy eating this time around because I get worried about disturbing her too much with the first meal (the Rubbers were both on their third pinky by the time I took these shots), but if you want to check out pics of her eating you can go here! If you like reading about these guys, you can see some baby pics here and here too. A week or so ago I saw my first rattlesnake and would have been overjoyed, except for the fact that it was dying. It’d either been run over by a car, or someone had broken its neck. The rattle was mostly gone (and many people kill rattlesnakes for the rattle, but they also may lose them in the wild), but I can’t know for sure. I got it off the road at least, but was pretty bummed to have to watch my first rattler struggle with death. A Healthy Fear of Snakes… But Why?